Indie stealth/platform/miscellaneous game Rain World impresses more each time we see it, and the developers have just released a soggy lump of new footage, above. See the adorable slugcat evade some baddies, chuck poles at things, and be consumed by the rainy land they find themselves in. Then hit 'replay' and watch the whole thing again, obviously. There's no release date yet that I can see for the Kickstarted game, but if you happen to be at E3 at this week, you'll get the chance to play a new build made for the occasion. This new build is where the above video comes from—as mentioned by the devs in this NeoGAF thread (thanks NeoGAF! 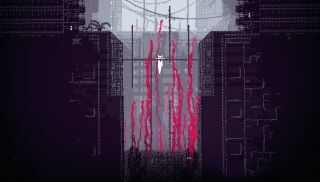 ), Rain World will soon be entering beta.